My workplace has this 4 week competition running currently where each week we are given a task, that each team has to participate in and will be judged on. So far we have had 3 tasks. 2) Second task was to build a straw and paper based contraption which will be dropped from 7 feet height and that which carry an uncooked egg. Bottom line, the egg shouldn’t crack. Boy did we get splattered on that one! 3) The third task was Runway’s version of catwalk called the Runaway(LOL…this cracks me up), which required us to fashion an Oscar worthy evening gown that was made out of newspapers and magazines. We are approaching the fourth task this week. And this week we have a classic kiwi style “Bake-Off”. We have to present 2 items – a muffin variety & a novelty dessert. Some of the daring bakers in our team, who I might add were not so worried about earning bad reviews decided they will bake something and test it amongst the team for feedback. And today, one of my colleagues, Aarti brought a very unique dessert. The type I haven’t tried so far. I should admit, there are very few categories and sub categories in the desserts section of the menu that I have not tried. However I must tell you this was something from a totally different league. 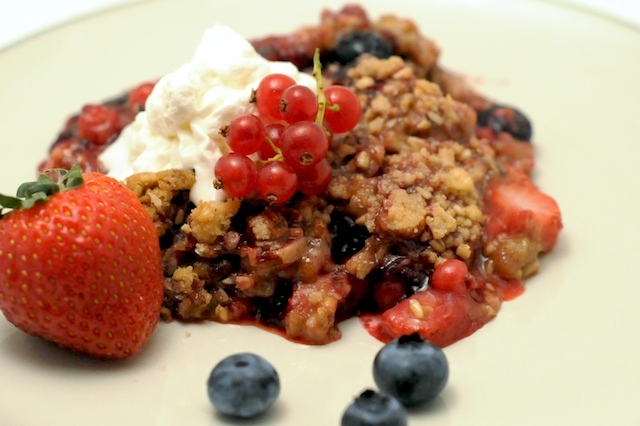 It was a “moist berry crumble”. I swear I could carry on eating this shamelessly and without the aftertaste of an overdose. It was purple and moist and felt good. The first taste into my mouth, the taste was puzzling to my taste buds. The taste took me by surprise at first. And then the tang hit me. Then sweetness melted me. It was just right. Not too rich or heavy. And finally made me close my eyes and sigh, because the coolness and goodness of the berries made me feel really really good on the inside. Don’t think I am repeating the word “good” time and again. I am pretty sure I will have many of you joining me in this category for using the same word if you tried it. It was baked to a humbling perfection. And this particular dessert “berrily crumbled” my preconceptions of the different types of desserts. It was in my opinion definitely one of a kind and was “berrylicious”. I have asked my dear colleague to share this recipe. And she has told me that she will forward it soon. Really looking forward to trying this one for sure!!!! Okay I better get going and add this to my “To-Do” List now. Keep your peepers open for this recipe!!! Cheerio! The following lines prove that you are an ardent Foodie!